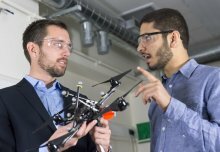 A new review, published today in Science Robotics and co-authored by Imperial researcher Dr Mirko Kovac, who directs the Aerial Robotics Laboratory in the Department of Aeronautics, looks at the state-of-the-art in robot construction and where we need to go next to make a robot-built environment a reality. It comes as the UKRI has announced £18m in funding to support digital transformation of the construction industry, of which Dr Kovac is a cooperating investigator on a project with UCL where his group will explore robotic platform solutions for collective robotic construction. The world is increasingly urban, and the researchers say that robots could be the perfect tools to help build and maintain new cities. Using robots should reduce human risk, allow tasks to be completed faster, and allow monitoring alongside construction – the robots could collect data on everything they are doing, helping to improve their practices. Dr Kovac said: “The cities of the future could be built and maintained by groups of land-based and flying robots working together to construct, assess, and repair the urban ecosystem of buildings and infrastructure. The team looked at examples from nature where groups of organisms use different tactics to work together in construction. Many animals in groups take cues from and leverage their environment when constructing or repairing their homes. For example, if beavers hear rushing water, they will apply construction material in that area of the dam until the sound diminishes. Termites, which live in large ‘super-organism’ colonies, rely on pheromones excreted during deposition of materials to coordinate construction. Many birds build nests as small colonies, organising the collection and distribution of nesting materials. Analysing these methods of coordination can help researchers design algorithms for how groups of robots and drones could autonomously work together during construction. But the team at Imperial is also developing drones that are based on nature in another way: through their design and the materials they are made from. The team at Imperial is also creating individual ‘soft aerial robots’– drones made of smart materials and structures that can interact dynamically with their environment. These include a drone that can dive and leap like a gannet and a spider-inspired drone that can create webs of tensile material and even suspend itself from them – as in the video at the top of the page. This crucial step will allow researchers to create drones that respond to the needs of a building while working alongside its human inhabitants. In a new partnership called the NEST Aerial Robotics Hub, a collaboration between researchers at Imperial and the Swiss Federal Laboratories of Material Science and Technology (Empa), drones will patrol a building to identify and fix minor problems alongside human inhabitants. The team also point out that these advances would benefit other areas where human intervention is tricky or too slow, for example in building emergency shelters following natural disasters, which would be 3D printed from flying drones. ‘A review of collective robotic construction’ by Kirstin H. Petersen, Nils Napp, Robert Stuart-Smith, Daniela Rus and Mirko Kovac is published in Science Robotics. Top video: Braithwaite, A., Alhinai, T., Haas-Heger, M., McFarlane, E., Kovac, M., (2018) Spider Inspired Construction and Perching with a Swarm of Nano Aerial Vehicles. In Robotics Research: International Symposium ISRR, Springer International Publishing.